The Husqvarna T435 is an excellent top handle chainsaw that will serve you well. A top handle chainsaw has a slightly different function than a rear handle chainsaw. Although you can use a top handle chainsaw on the ground, they are designed for working at an elevated position and should not be used for ground wood cutting. Whether from a platform, in a harness or when climbing hard to reach places. It’s designed to be comfortable and safe, while working in awkward positions. You’ll often hear people refer this type of saw as an arborist chainsaw. A top handle chainsaw is engineered for optimal balance and maneuverability while being light and powerful, allowing you the flexibility to work from any angle when you’re up in trees. It’s a myth that a top handle chainsaw is meant to be used one-handed. That’s not the case. The typical user of this type of saw requires short wrist movements, agility and the ability to extend their arms to reduce fatigue while working. Arborists require them, as well as other Professional’s who do work off the ground, in jobs related to: tree service, landscaping, public road maintenance, and tree surgery. You can add yourself to that list If you’re a homeowner who needs to, literally, get up in the trees. If that’s the case, then a top handle chainsaw is the only option for you, just make sure you understand and practice safe operating procedures while doing so. I’ve included some safety tips on using a top handle chainsaw at the end of the article, as well as another alternative you should consider — a pole saw, which is a much better choice for an inexperienced chainsaw user. When working at an elevated and/or restrictive position safety is of the utmost importance. No other type of chainsaw will be appropriate for this type of work than a top handle chainsaw — and you’d be foolish to try otherwise. Quality top handle chainsaws allow the operator to carry the tool up into the trees with relative ease, with the ability to connect to a climbing saddle via a built-in lanyard — and both of these Tanaka chainsaws have a lanyard hole, which you would expect with any top handle chainsaw. As far as quality goes, Makita chainsaws are on par with mid-level Husqvarna and STIHL chainsaws. Makita makes exceptional professional-grade chainsaws at a very reasonable price point, although many homeowners will probably consider them expensive. If you’re just looking for the cheapest top level chainsaw then I recommend buying the Tanaka brand reviewed later in this article. If you have some money to spend and want premium quality then Makita (or Husqvarna) can’t be beat. Well, STIHL is also a premiere brand. Why Makita? Well, they have a strict commitment to quality control. 19 Total quality checks on the motor alone. Heat treated shafts and Gears for increased durability. Strict tolerance levels for long lasting performance. Most rigorous testing includes electrical resistance, surge durability and mechanical efficiency. 3-Minute final run test under power ensures maximum performance. One battery goes a long way with the Makita system. Makita designs and engineers their own motors. They’ve been in business for over 100 years. They know how to make tools. I don’t want to sound like a commercial for Makita as I cover all brands of chainsaws but Makita is at the top of my recommendation list. Note: A top handle chainsaw should not be used on the ground. I know some people do but that’s not what they’re designed for and I don’t recommend it. Please work safely. It’s not worth the risk. Ever! Can be easily carried with one hand. For starters, this is a 12″ top handle chainsaw powered by a robust 36V Makita-engineered motor. It has plenty of torque and power to prune and trim. This is a unique saw because it uses two 18V batteries working in parallel to produce 18V of power. This Makita XCU02Z chainsaw is made for people who value high-quality tools. There are many cheap chainsaws available on the market, and they’re perfectly good chainsaws for the average consumer — but this chainsaw is on a different level. It’s a pro-grade top handle chainsaw, and you’ll pay a reasonable price for it. This is an excellent chainsaw if you’re working on an elevated platform high off the ground. When working in the trees, the the last thing you want to be using is a cheap chainsaw. A quality top hand chainsaw has built-in safety features that are essential, such as the “dead man’s trigger,” which means the chain will automatically stop when you take your finger off of the trigger. Why does that matter? Well, if you lose your balance you don’t want a running chainsaw in your hand. So, all you have to do is take your finger off the trigger to prevent a horrible accident. Also, this has a built-in metal lanyard loop which is retractable and stays out of the way when you don’t need it. It’s used to haul and attach your chainsaw to when you’re climbing up into the trees. Replacement chain: Makita 531-290-046 chain. Makita patented motor running the chain at 1,650 FPM. Runs quietly at 89 dB(A). Weight: 11 lbs with batteries. Automatic lubrication system with extra large oil reservoir. LED battery meter to keep track of your battery power. Protection against overloading and overheating. Powerful, compact and professional-grade quality. If anything should happen to break down on this chainsaw Makita has you covered for 3 years. That’s a longer warranty than what most power tool manufacturers give to their customers. Learn more about the warranty terms on the Makita site. This a a very quiet chainsaw, which is a major benefit of spending the extra money a quality battery powered chainsaw. Who wants to listen to the sound of a loud saw if you have a choice not to. Of course, you should always use the proper safety protection and that includes hearing protection but with this Makita chainsaw, it’s optional. Just to give you a frame of reference of the sound output. The Makita XCU02Z has noise rating of 89 decibels. Heavy city traffic has a rating of 85 decibels. So, you don’t need hearing protection and it runs quieter than a walk through your city. This is an exceptional chainsaw for a lot of reasons, but most importantly it’s built to be durable, long lasting and its made with very high quality components. It really is worth the money. If you value safety and high-quality tools then this is definitely one of the best chainsaws for you. This is a wonderful top handle chainsaw! It really is. Innovative Battery system that allows you get the most from your batteries. If you’re considering buying this chainsaw then you’ll want to watch this in-depth 2-Part video on the Makita XCU02Z 36V chainsaw. Net Weight : 11.2 lbs. Shipping Weight : 11 lbs. You need to know that the batteries and rapid charger are both sold separately. If you have own other Makita tools or 18V or 32V power tools you’ll be happy to know that the batteries are interchangeable. Learn more about battery compatibility on the Makita site. Luckily, Makita provides a wide range of batteries that provides you with the ability to buy exactly what you need. 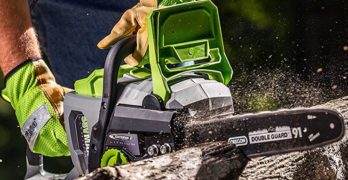 If your budget is low and you only need to used this chainsaw for short trimming tasks then buy the BL1820 (2.0Ah Battery). On the other hand, if you have the money to spend and want to use this chainsaw for an extended period of time then you definitely should buy the Makita BL1850 (5.0Ah Battery). It really depends on your needs and budget. It’s not complicated. Just don’t forget to purchase the batteries (and charger) otherwise you’ll have an expensive sculpture to hang on the wall. Currently, there are 4 different batteries that you can choose from. They are identical except for their Amperage (Ah) rating. 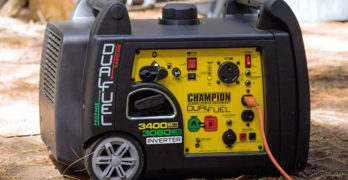 Amperage refers to the amount of power the battery holds. The higher the ‘Ah’ the longer the battery will last which means you can work longer before being forced to stop. Match the batteries to your working requirements. A second battery is a smart idea if you need to work continuously. You can be using one set of batteries while charging the other two, allowing you to work all day if you need to. Yes, it would be expensive. If you own a business and don’t want a gas chainsaw then it will definitely be worth the money. Or, just buy one of our gas top handle chainsaws that are contained in this review, like the Husqvarna T435. Provides up to 65% more run time per charge compared to the 18V 3.0Ah battery (BL1830). 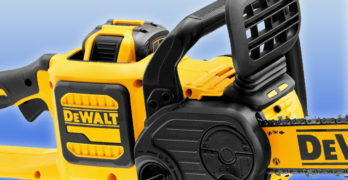 Compatible only with Star Protection tools, indicated by the Star Symbol and/or Yellow Battery Receiver under the power tool. Can be fully charged in under 45 minutes when using the Makita Rapid Optimum Charger (sold separately). See below. Provides constant power and running time under extreme temperatures, including winter (-4º F/ -20º C). STAR Protection Computer Controls enables the tool and battery to monitor operating conditions while working and communicates data in real-time to protect the tool against overloading, over-discharging and overheating. The Makita Rapid Optimum Charger (sold separately) communicates with battery’s built-in electronics during charging in order to optimize battery life as it actively controls current, voltage and temperature. Impact-resistant outer case and shock-absorbing inner-liner are extremely tough and durable in order to protect the battery. Sixteen contact terminals maintain a constant connection with the tool to help prevent power loss or fluctuation, even during high-vibration cutting. Battery does not self-discharge and stays ready to be used even after long periods of storage. 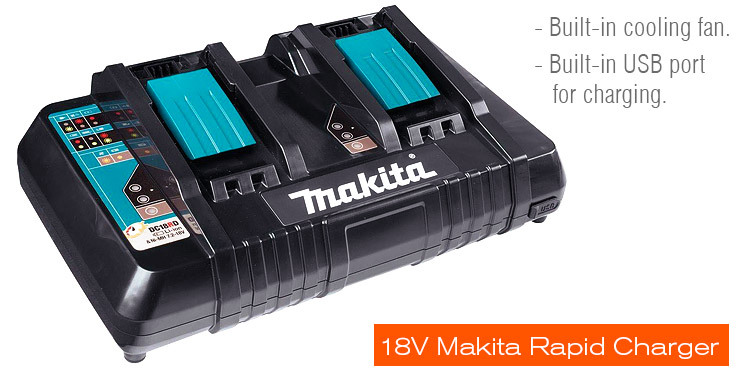 View or download the MANUAL for the Makita DC18RD Rapid Battery Charger. Charges two (2) 18V Compact Lithium-Ion 2.0Ah batteries in 25 minutes. Charges two (2) 18V LXT Lithium-Ion 3.0Ah batteries in 30 minutes. Charges two (2) 18V LXT Lithium-Ion 4.0Ah batteries in 40 minutes. Charges two (2) 18V LXT Lithium-Ion 5.0Ah batteries in 45 minutes. Built-in USB port for charging your electronic devices. Optimizes battery life by actively controlling current, voltage and temperature. Built-in fan circulates air through the battery as its charging in order to keep the battery cool which increases charging time. Batteries don’t like heat. And, lastly, if you own your own business or you own several Makita tools then you might have a need for this 4-Port Makita 18V charger. It’s the king of chargers! Convenient but does not charge simultaneously. This will accommodate up to 4 Makita 18V Lithium-Ion batteries BUT it does not charge them all 4 batteries at once. Essentially, it charges two at a time, then once those are completed it automatically starts charging the remaining batteries. I’m sure there’s a logical reason why all 4 batteries can’t be charged simultaneously so I’ll give Makita the benefit of the doubt. Sometimes technology has limitations. A power outlet can only give out so much juice. Also, if it charged all 4 batteries at the same time it would probably be much slower and it would take twice as long to get a fully charged battery (assuming you were charging 4 batteries). With this system you can have 2 fully charged batteries quickly and the other two can continue charging. If you work alone, you can only use 2 batteries at the same time anyway. Either way, whether this charger is a good idea really depends on how you use your Makita tools. Only you can decide that. I just provide the information. That’s my job! This is an expensive chainsaw but you really do get what you pay for. If you’re thinking that this Makita chainsaw, model Makita HCU02C1, looks like the previous Makita model I just reviewed (XCU02Z X2), well, you’re almost right. This chainsaw is the exact same chainsaw. Everything is the same except for the battery system. This model has one large 36V battery. The Makita XCU02Z X2 comes with a battery adapter that allows it run on two 18V batteries instead of one 36V battery like the HCU02C1. It sounds complicated when reading so I created this diagram to make it easy to see exactly what the differences are. Same chainsaws with a different battery system. Another difference is that you get the charger and the battery when you purchase this chainsaw. It all comes together in one bundle. It makes sense because Makita has very few tools that use this 36V battery. Get an extra battery (Makita BL3622A 36V) if you need it — it’s not cheap. It’s a large battery up-close. Lots of juice that will cost you. Compact, powerful, tough, quiet and comfortable to use. The exact same chainsaw but the Hitachi is cheaper. If you’ve never heard of Tanaka, don’t worry, they’re a reputable Japanese-based company and they’ve been around since 1915. Recently, they were purchased by Hitachi and are now part of the Hitachi Power Tools group. Today, Tanaka is known as Tanaka Power Equipment, focused on providing solutions for professional landscapers, homeowners, and utility professionals with commercial grade, two-stroke outdoor power equipment. I know, it’s odd that so many chainsaw brands are competing with each other and most consumers aren’t aware that different brands are owned by the same company. For example, McCulloch, Poulan and Poulan Pro are all brands owned by Husqvarna. Yes, that’s true. I wouldn’t lie to you. You can read about it on their company site. Either way, I think this is a good time to introduce you to the 14″ Hitachi CS33EDTP top handle chainsaw — which you’ll notice is identical to the Tanaka top handle chainsaws that I’ll be reviewing in this article. Look closely at the pattern of the grill on the Hitachi and compare it to the Tanaka. They share the same casing but the vibrant green color makes it look quite different. Product design sharing happens all the time, just pay attention and you’ll start noticing it. But the main difference is that the Hitachi version is much cheaper and all things being equal, you’d be silly to buy the Tanaka over the Hitachi. The 16″ Tanaka model is under $200. It’s a well made top handle chainsaw, although a little on the heavy side at just over 12 lbs, but overall customer satisfaction is quite high with this under-appreciated chainsaw. Let’s take a closer look at the Hitachi model. I repeat — if you’re on a budget get the Hitachi model. Comes in 14″, 16″ and 20″ bar and chain. Only the 14″ model is a top handle chainsaw. A very good chainsaw for the money. Not perfect but still a good saw. The Tanaka brand is comprehensive in scope, as they offer a full range of equipment, including: grass trimmers, brush cutters, multi-task tools, chainsaws, blowers, hedge trimmers, edgers, augers, gas powered drills, water pumps and a complete mix of accessories. Before I even get into the details of the Hitachi CS33EDTP I have to tell you that not only is this top handle chainsaw very affordable (under $200) but it also comes with an unheard of 7 year warranty. That’s a fact. It really does sound too good to be true but you won’t find a better warranty anywhere than this. The quality isn’t as good as a Makita chainsaw or Husqvarna but if you’re on a budget and want a good chainsaw then this is the top handle chainsaw for you. It’s nice to know that if it does break down, you’re covered for 7 years. Now that’s a company committed to their customers. It comes in three different bar and chain sizes, as you can see below. Great value and it has anti-vibration handles. View or download the MANUAL for the Hitachi CS33EDTP. View or download the PARTS LIST for the Hitachi CS33EDTP. 32.2.cc 1.6 hp PureFire two-stroke engine meets emissions levels without sacrificing power, adding weight or creating maintenance headaches. Commercial grade engine provides excellent cutting performance and reliability. 14″ Oregon sprocket nose bar and chain reduces kickback and provides excellent cutting performance. Outstanding power-to-weight reduces fatigue resulting in higher productivity. Side access chain tensioner provides for quick and easy chain adjustment. Half throttle choke and purge primer bulb for easy starting. Built-in lanyard ring for easy climbing. Advanced anti-vibration system provides maximum comfort to get more done with less operator fatigue. 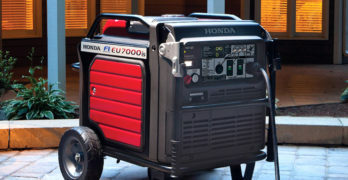 Covered by Hitachi’s seven-year consumer use warranty, two-year commercial use warranty and one-year rental use warranty. 32.2cc 1.6 HP commercial grade engine. Great cutting performance and reliability. Five-point anti-vibration system provides maximum comfort for getting more done with less fatigue. 16″ Oregon bar and chain reduces kickback and provides excellent cutting performance. Two bar mounting studs keep the chain at peak cutting efficiency. You’ll see why this is relevant in a second. Bear with me. When browsing online reviews for the Hitachi CS33EDTP make sure you’re reading actual customer feedback from the 14″ top handle model because the 16″ and 20″ are rear handle models and seem to have chain brake issues. The quality of the rear handle models seem to be inconsistent, so take that into consideration. Notice in the customer reviews on Amazon are specified in small text under the reviewer (see image below). When there are variations associated with the listing, as is the case with this Hitachi chainsaw it can be confusing as all the reviews are combined. Most people don’t check to see if the reviews are “verified.” Verified means that the person reviewing the chainsaw actually bought it from Amazon. Anybody can post a review. I always disregard non-verified reviewers when making a buying decision. Too often, people overlook these small details but if you want accurate information you have to know where to look. I hope this helps. Look closer at Amazon product reviews. The story is in the details. Both these Tanaka chainsaws have an excellent power-to-weight ratio, powered by Tanaka’s PureFire low-emission two-stroke engine, which means it’s fueled by gasoline. It has a chrome-plated cylinder, with a steel connecting rod and an oiler driven by a heavy-duty. Both are equipped with a 12 inch sprocket nosed bar with a side mounted chain adjuster. Unfortunately, it’s not a tool-less tensioning system. Hey, you can’t have everything. This chainsaw is also ideal for pruning, limbing, shaping and hobby work, for example, if you’re a chainsaw sculptor. But as I stated earlier, it’s engineered to be used while elevated and for exceptional mobility, which typically go hand-in-hand. If you’re buying a top handle chainsaw it’s because you require the maneuverability that they provide you with, and when you’re working off the ground then maneuverability and freedom of movement are top priority. The only difference between the Tanaka TCS33EDTP/12 and the TCS33EDTP/14 is the bar and chain size — 12″ and 14″ respectively and the weight. Everything else is exactly the same. 32.2 cc PureFire two-stroke engine: Powerful, lightweight and meets emission standards. Professional quality engine for efficient cutting and high reliability. 12″ OREGON sprocket nose bar & chain for reduced kickback. Balanced power-to-weight allows you to be more productive and minimize fatigue. Side chain tensioning allows for quick and easy chain adjustment. Easy starting: Half throttle choke and purge primer bulb. Built-in lanyard ring for safe climbing. Superior anti-vibration system reduces fatigue and increases comfort and productivity. 7 year consumer, 2 year commercial and 1 year rental warranty. Fairly heavy for a top handle chainsaw but affordable. The Tanaka TCS33EDTP/12 top handle chainsaw is the 12″ version of this highly capable top handle saw and slightly lighter by .5 lbs. Don’t buy this if you need to cut firewood or fell trees, or if you have a need for any type of conventional tree cutting work on the ground. This is a very agile and capable top handle chainsaw; perfect when working from a platform or climbing trees, where the demands require you to make quick cuts in succession while working in cramped and odd positions. Comes with: 12″ Bar and Oregon Chain, Bar and Chain Protective Cover, Scrench. 7 year warranty should give you peace of mind. The Tanaka TCS33EDTP/14 top handle chainsaw is the 14″ model and weighs a little more than the TCS33EDTP/12, so if you have the need to cut branches up to 14″ in diameter then this is the chainsaw for you. Tanaka has high standards for its parts and manufacturing, with a history of innovation, so you can be confident that you’re buying a quality product if you decide to purchase either of these top handle chainsaws. The cost difference between both these chainsaws is minimal at around $10, and they retail for a little over $200. For a professional grade top handle chainsaw, it’s very fairly priced, but ultimately it comes down to your needs and the type of work you plan on using it for. Safety is the utmost importance, so if you plan on working off the ground then make sure you buy a top handle chainsaw to reduce the chance of injury. These Tanaka chainsaws provide you with all the features you need to safely go about your work, and with enough power to tackle the difficult work ahead of you. An exceptional top handle chainsaw that endure over the years. The Husqvarna T435 top handle chainsaw is exactly what you would expect from a Husqvarna quality. It’s ultra-lightweight at only 7.5 lbs (without the bar & chain). It’s well-constructed and easy to maneuver. Designed specifically for cutting while elevated or up high in the trees. Easy to use with one hand if you must, but this is not advised for safety reasons. This is a well-balanced chainsaw that can be used be anybody — young or old, male or female. 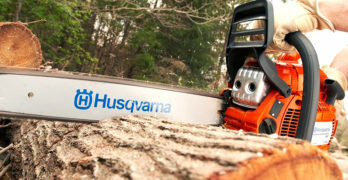 Husqvarna always manages to pack a lot of practical features in their chainsaws while keeping them lightweight. To contrast; the Tanaka chainsaws weigh around 12.4 lbs. That’s a significant difference that you shouldn’t overlook. I’m not exactly sure of the weight of the Husqvarna T435 when you add the bar and chain but it’s nowhere near 12.4 lbs. Bottom line: This is a light chainsaw. For a little more money this Husqvarna T435 top handle chainsaw should be at the top of your list. It’s worth every penny in terms of the overall value and craftsmanship that you get. Not to mention that it’s automatically safer to use because it’s so lightweight. A few of the great features of the Husqvarna T435. The Husqvarna T435 is excellent for pruning but many owners also find it comfortable to use on the ground for light-duty cleanup around the yard. I strongly discourage using a top handle chainsaw for ground cutting as it has an increased risk of kickback. Chainsaws are dangerous enough, don’t be stupid and increase your risk of injury by buying a chainsaw for the wrong purpose. A top handle chainsaw is designed for working up high where you need the versatility to cut from a variety angles. Cutting up high requires a lightweight top handle chainsaw. The Husqvarna T435 is powered by an efficient and effective 35.2cc X-Torq engine. The T435 has great set of features combined in a well-balanced package that’s easy to handle while working up high. If you’re on a budget and need a top handle chainsaw then the Tanaka models are quality saws but if you can afford to spend a little extra money then I have to recommend the Husqvarna T435 or one of the Makita models. The Husqvarna is an exceptional gas top handle chainsaw as it’s incredibly light to handle and made to the high quality standards of Husqvarna. On the other hand, the Makita battery powered top handle chainsaws are super quiet, well-made, durable, light and very low maintenance. I’ll admit, being cheap is smart when buying a large variety of product but with a top handle chainsaw, that you’ll inevitably haul up a tree and work from an elevated position, it’s better to buy a light chainsaw that you can depend on. Your life is worth the extra $100! Essential protection for your eyes, head and ears. These Tanaka top handle chainsaws are basically the same, except for the minor differences already mentioned in this article. The Tanaka top handle chainsaws are very affordable but they do lack the refinements and overall build quality of Husqvarna or Makita chainsaws. Also, the extra weight is an important consideration for a top handle chainsaw. They are well-engineered and they have a good power-to-weight ratio, well-balanced, agile and reliable to use while climbing or working from an elevated position. Made from high quality and durable materials, these top handle chainsaws should last you a long time if you take care of them. Whether you decide to buy Tanaka, or the Husqvarna T435 or another brand, just make sure you choose the right chainsaw for your needs. You can read our Chainsaw buyers Guide if you’re unsure whether a top handle chainsaw is right for you. Although, the rule is simple: If you need to climb trees or work up in the trees, you need a top handle saw. Period! An excellent alternative to a top handle chainsaws for homeowners is the pole saw. These are designed to cut branches from a distance, up to around 16 feet, depending on the model. These are very versatile and effective tools, so if you’re not comfortable working above the ground then buy yourself a pole saw (if the branches are within reach) or call a professional in your area to do the work for you. If you’re interested in cutting branches from a distance but want your feet to bet firmly planted on the ground then a pole saw is exactly what you require. The Husqvarna 1827EXLT pole saw is a great option and we’ve recently reviewed it. Or, if you just need a cheap pole saw to be used occasionally then you might consider the very inexpensive Remington RM1025SPS Ranger at under $100. And, it doubles as a chainsaw. The saw detaches from the pole so you get two tools in one. Husqvarna 327PT5S pole saw. 24.5cc 13-Foot. Gas powered. There are many options on the market for elevated cutting. Choose the chainsaw that makes sense for your needs. Do I need to climb the tree or can I work from a platform instead? Do I have the appropriate skills? If so, do I have the right support staff, including supervisors, for this task? Do I have a backup plan in place, including an emergency contingency plan if things go awry? It’s important to remember that the risks of a top handle chainsaw extend beyond that of the climber, and to the workers below. Fasten your top handle chainsaw to the harness for safe transport, and make sure that anybody below you is outside of the potential drop zone just in case the chainsaw were to fall. This is critical. Always plan with failure in mind. Do I really need to use a top handle chainsaw? Can I use a lopper or a hand saw instead? Always use two hands. Top handle chainsaws are not designed to be used with one hand. Assess the nature of the wood you’re about to cut and identify any hazards, such as nails and wires to steer clear of. Also, be aware of compression and tension, and other parts of the tree which the top handle chainsaw could accidentally connect with and cause kickback. Take into account the type of wood you’re about to cut. Hard vs soft. Is it brittle and dry? Some trees are prone to tearing. Never cut with the tip of the bar, otherwise known as the kickback danger zone. Always be conscious of your cutting position and potential danger areas. Make sure your top handle chainsaw is always below shoulder height, and never above. Do not put yourself in a vulnerable position, where a fall will place you in direct contact with the saw. Never use the saw to brace yourself or use it as a means of support. Be aware of epicormic growth. Turn off your top handle chainsaw before removing it from the wood if it becomes trapped or stuck. For more information on safety read our article on Safety Tips for chainsaw users. Pole saws are an excellent alternative to top handle chainsaws, like the versatile Husqvarna 327PT5S pole saw. You can do all your cutting while standing on solid ground. No need to climb trees and put yourself in a potentially dangerous situation. If you need to do some pruning within about 16 feet then buy a pole saw.They are fantastic tools perfectly suited and designed for small jobs around the yard. Essentially, a pole saw is a small chainsaw attached to a telescopic metal pole, allowing you to cut those hard to reach branches. If you’re not comfortable working from an elevated position and you don’t have the experience or equipment to do it safely, then please don’t even attempt to use a top handle chainsaw above the ground. Call a professional. I’ll have a full guide on pole saws soon, but for now, view the links below for some fantastic models to consider.